Hold Fast by Blue Balliett. Grades 4-7. Scholastic, March 2013. 288 pages. Reviewed from ARC provided by publisher. The Pearl family doesn't have much, but they hold fast to their hopes, the biggest of which is a house to call their own. Eleven-year-old Early Pearl loves her family dearly, but it wears on you, living with her parents and baby brother, all four of them crammed into a studio apartment with no space to do anything on your own. Early's dad Dash is the light her her world, teaching her about the power of words and helping the family keep a notebook of special words that they love. One day, everything changes when Dash mysteriously disappears and bad men ransack the Pearl apartment. Early and her family are forced out onto the street, desperately looking for help in a world that seems to see them as less than human just because they don't have any money. The police seem to suspect her father of something illegal, but Early knows her father was a good man and she's determined to help track him down. But what Early stumbles into is way more than she bargained for. This is an exciting mystery set in a cold Chicago winter, perfect for kids who love words as much as Early Pearl does. So... books about kids living in the shelter system. Any come to mind? Hmmm. Me neither. Until now. And what a book to put into the hands of young readers. The writing is poetic, each word carefully chosen. Poetry (and particularly the poetry of Langston Hughes) is an important element in the story and the writing style reflects that. Blue Balliett places her readers in a cold, Chicago winter and the setting is vivid in every scene. I have clear pictures of the shelter, Early's school, and the Harold Washington Library (which factors in greatly). The book is not without its problems. With the exception of the Pearl family, most of the adults in the shelter are hitting their kids and/or dealing with substance abuse. Another down-on-their-luck family is nowhere to be seen. It feels a bit stereotypical. That said, this glance at homelessness (particularly Early's struggles at a new school) will certainly be eye-opening for many kids and they'll be rooting for the Pearl family to get back on their feet. Readers who enjoy a high-stakes mystery coupled with a fine art theme should definitely pick up Blue Balliett's first novel Chasing Vermeer and its sequels. They also might enjoy Elise Broach's Shakespeare's Secret or Masterpiece. Readers who enjoy the strong urban setting in a mystery might try the wonderful When You Reach Me by Rebecca Stead (set in New York City). The poetry of Langston Hughes factors heavily into the story and young readers might be interested to read more. 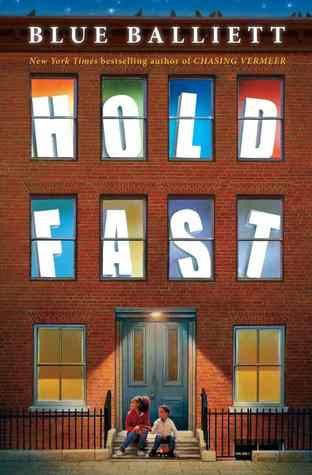 Hold Fast is on shelves now!